Mediterranean house design is influenced by both Italian and Spanish architecture. Common features and materials include clay tiles and grills. Warm colors such as red and oranges are common for this style. Mediterranean cultures have tended to dominate most conversations about architecture from antiquity to the latter-19th Century. The Greeks and Romans left a truly remarkable legacy in the form of surviving buildings that continues to inspire people from around the world today. As a matter of fact, it’s safe to say there is no formally-trained architect anywhere in the world that does not study the works of ancient Greek and Roman architects. One can easily make the argument that nearly all modern and contemporary architecture today owes at least some debt of gratitude to the pioneering architectural studies of the different Mediterranean civilizations. The use of arches, ornamental detailing, and white paint for aesthetics and to reflect light and keep the internal temperatures down is something pioneered by Mediterranean architecture thousands of years ago that continues to see use in architecture today. One reason Mediterranean architecture continues to be popular today is that the construction and aesthetics are uniquely-suited for small-to-medium sized homes in warmer climates. One can easily find Mediterranean inspired homes and other structures in a wide variety of related styles in the Philippines. And though we may not immediately realize it, principles of Mediterranean architecture have also made themselves part and parcel of Filipino architecture, thanks to our historical links with Spain, which is itself a Mediterranean country. Many examples of our own bahay na bato tend to incorporate arches, columns, passive cooling, and ornate décor that was not part of the native architectural vernacular. Today, the many different styles of Mediterranean architecture hold a special place for many Filipino homeowners. One can even say that Mediterranean architecture is truly a part of our heritage today. The similarity of our sunny tropical climes to the Mediterranean’s have allowed the types of structures typical in the region to fit right into the local context with minor modifications. There are a wide number of Mediterranean styles spanning from the antiquity to the present day. Here are some popular Mediterranean styles that are often used for inspiration in the Philippines. The stark, minimalist appearance of traditional coastal Greek homes is an increasingly popular look for homes throughout the Philippines. The white-washed exteriors and blue highlights are an instantly recognizable throwback to antiquity that is easily adapted for modern tastes and materials. The use of white is functional and serves to reflect away heat from the structure, keeping energy costs down. In contrast to traditional Philippine houses, no sloping roof is present in contemporary Greek Revival homes, and the roof can be used as an additional space for plants, laundry, or for relaxing. It’s not just for minimalists either. Greek elements can easily be adapted to other tastes as well. Other elements that can be present are Greek columns and pediments, painted plaster, and a prominent horizontal transom. Grander examples may have embellishment and detailed moldings. In the local context, Roman-style Mediterranean architecture often refers to styles reminiscent of Roman country villas. They share many passing similarities to Greek-style homes. As a matter of fact, both Greek and Roman styles are often lumped together and referred to as the “Classical” or “Italianate” style. Many elements of Roman-style villas are present in some of the Spanish colonial architecture found in the Philippines and in the Americas. These include central courtyards elaborate tile-work, a nod to the mosaics of Ancient Rome. Functional houses, there are typically spaces for storage of tools and farm equipment and a separate living space within the same structure. The basic layout of a villa with a central courtyard can also be easily adapted to contemporary tastes, and many examples of houses with this layout can be found today. Grander houses in this style would also incorporate arches, columns, and tilework for the roofs. In contrast to the Greek all-white style, pastel color such as light pink, peach, and similar shades are more common. Islamic influences permeate much of post-Roman Mediterranean architecture, even in Christian countries. Trade with Muslim states, the long occupation of Spain by the Moors, and the Crusades fundamentally changed both the aesthetics and the technology of Mediterranean architecture. Decorative screens with elaborate geometric designs, pointed arches, and indoor pools and fountains are just some of the influences of the North African and Middle-Eastern styles of Mediterranean architecture today. Decorative motifs and small details in local traditional houses can often be traced to this period of interaction with the Middle-east and North Africa. Moorish-inspired design elements such as tiles, geometric patterns, balconies, and lattices for passive cooling are still very much viable options for houses in the Philippines. These elements can also be easily adapted for building a striking, yet modern home. When one thinks of Venice, buildings with this Mediterranean style are often what come to mind. They are a legacy of Venice’s past role as a major trading power at the so-called crossroads of the world. The style is an eclectic combination of German and Northern Italian Gothic, Byzantine, and Moorish styles. The style was heavily influenced by the fact that Venice stands on soft soil. Weight-bearing walls were not as common in this style, and internal structures were more prominently used. This gives Venetian Gothic a very graceful-look compared to previous and future styles, up until the Industrial Revolution. This all prefigured Renaissance styles and feature a lightness of character and a less-strong emphasis on symmetry than would be seen later on. It would later see continued revivals from the 19th Century to the present day. While not a very influential style in the Philippines, many Venetian Gothic elements consistently find their way into contemporary homes in the Philippines, especially with regards to the use of tiles, window shapes, and archways. Italian Renaissance-style homes are essentially an evolution of Roman-style homes. Many of the same basic layouts and patterns can be observed, including the inclusion of a courtyard. However, where the Romans fancied themselves austere, Italian Renaissance style houses are much more ornate, and the additional detailing tends to give them a more grand appearance in comparison to the Roman homes they evolved from. Homes built in the Italian Renaissance-style and associated revival styles also have a strong sense of symmetry, proportion, and geometry thanks to the ideas on aesthetics developed by the architects of the Renaissance period. In the Philippines, statues and fountains in the Italian Renaissance style and certain decorative elements continue to be popular all sorts of homes. The generous use of marble is also a holdover from this era that continues to find its way in all kinds of architecture today. Structures built in the Spanish Renaissance style have a number of similarities with Italian Renaissance buildings. The emphasis on symmetry and proportion are all still there. However, there are generally a lot more elements from older Gothic architecture that persist. Faux and recessed columns and recessed arches that first appeared in Gothic architecture are more commonly found in these structures. In the Philippines, numerous churches with these elements are still standing all over the country. While no houses from that period survive, revival Spanish Renaissance houses are found all over the country. One characteristic of Spanish Architecture was its adaptability, and designs that were designed for Mediterranean and Atlantic climates were adapted for use in the typhoon-swept Philippines. Hundreds of examples of Spanish Colonial houses still survive, and most of these were of the bahay na bato type that was particularly suited for the climate. Spanish Colonial houses and structures in different styles from the indigenized bahay na bato are also found, though in much fewer numbers. These tended to be plainer versions of the Renaissance and Baroque architecture found in Europe. Some common characteristics of these less-indigenized examples included stucco walls, painted tiles, terracotta roofs, courtyards, and patios. Balconies, another Arab-Moorish design element, are also a major design feature of these structures. Overall, Spanish Colonial architecture is a clear evolution of the styles pioneered by the Greeks and Romans mated with local sensibilities and popular styles emerging in Europe. A few of these more-European houses can be found in Intramuros. French Mediterranean-style architecture is often characterized by terracotta tiled roofs, white exterior walls, and a much lighter, airier look than similar structures in Spain and Italy. An emphasis on bright spaces and relatively clean lines is often present, as is the inclusion of typically French decorative elements, such as intricate ironwork. Compared to Spanish and Italian-style Mediterranean architecture, French Mediterranean spaces evoke a feeling of effortless fun and care-free living. Many of the visual cues can be seen as a precursor to the minimalist styles. The Ejercito house in Laguna, as seen on the TV series Dolce Amore, is a stunning example of Contemporary French Mediterranean architecture transplanted into the Philippines. This was the style prominently pushed by the École des Beaux-Arts in Paris, from the 1830’s onwards, remaining popular towards the early 20th century. Like the previous Classical revival and Baroque styles, it still retained an emphasis on symmetry. However, it added a number of features, many of them throwbacks to much earlier times. “Rusticated” masonry and elevated ground floors became even more prominent, and arched windows and doors became more prominent. The use of statuary and bas-reliefs became more strategic and commonplace, and very subtle polychromy was often employed on structures. A number of structures in this style can be found in the Philippines, including the El Hogar Filipino Building, Regina Building, Natividad Building, and Calvo Building – all in Escolta, Manila. The Natalio Enriquez Mansion in Sariaya, Quezon is perhaps the most cited example in this style in a residential context. While less popular for new single homes, adaptations of the style continue to be influential for new luxury condominiums and apartments. While there’s much diversity in Mediterranean architecture, there are plenty of features that tie these popular styles together. These details are perhaps the most common giveaway that a home is done in a Mediterranean style. While less prominent for Greek houses, arches have been prominent in every Mediterranean architectural style since the Roman period. In almost every application where significant weight needed to be supported, arches would almost certainly be present. From the Greeks onwards, ornate décor has been part and parcel of the Mediterranean style. While the Romans certainly pared it down, they were not minimalists in the sense that we understand today. Filipinos definitely seem to have an affinity for ornate decorations, which may explain the continued popularity of the more complex styles and visual patterns for new homes. White as a default paint color for home interiors can even trace its roots to ancient Mediterranean architecture. White walls, especially those executed in stucco, are a very prominent part of Mediterranean architecture that continues to be influential today. These walls are more prominent in simpler homes, but could also be found in complex structures executed in a Mediterranean style as well. White stucco, in particular, is a very practical material in the Philippines. It helps reflect light, keeping the structure cool, and the white color does not fade easily in the sun. Being able to afford these features in a home was often a sign of wealth, and this is still true to a degree. As the Mediterranean coast has a much more pleasant climate than Northern Europe, the addition of a space where one can enjoy the outdoors in relative privacy is definitely a huge plus. In the Philippine setting, the same thing very much applies thanks to our comparatively mild weather. This has led to this feature often being included in contemporary homes that are not strictly Mediterranean in style. While not present in all examples Mediterranean architecture, roofs with gentle slopes are quite prominent across most styles. Compared to traditional Philippine houses such as the bahay kubo and bahay na bato that generally have a steep slope on their roofs, Mediterranean houses tend to have a much gentler slope. Roof tiles also tend to be made of terracotta, which is also still much desired for contemporary Philippine houses executed in a number of different styles. The distinct red terracotta allows decent insulation and cooling – especially when contrasted to bare galvanized iron roofs – and they have a distinct look. The fact that red continues to be a popular color even for galvanized iron roofing sheets is evidence of the pleasing aesthetics of these tiles. 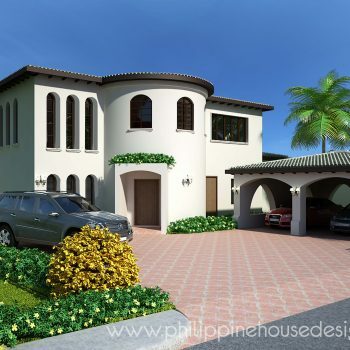 Mediterranean style architecture is an excellent starting point for houses built in the Philippines. Not only is it practical for our climate, buildings built in Mediterranean styles also do not look out of place in the local setting. As we have 400 years of history under the rule of Spain, which itself is a Mediterranean culture, many of the prominent features of Mediterranean homes are already accepted and existent in the local architectural vernacular. Altogether, this makes these styles all the more appealing for a prospective homeowner.